These are apparently not the best of times for the leadership of the Pinnick Amaju-led board of the Nigeria Football Federation (NFF) as Minister of Sports, Solomon Dalung insists that the body must face the Economic and Financial Crimes Commission (EFCC) over misappropriation of over $1m Federation of International Football Associations(FIFA) developmental grants to Nigeria and other funds from the Federal government. During the Annual General Meeting of the NFF in Lagos recently, an enraged Dalung who labelled the NFF as the most corrupt goverment agency in Nigeria had insisted that the Glass House stinks to high heavens and needed thorough cleansing as financial maladministration in the place since the present board came in 2013 has robbed Nigeria of her presence at the African Cup of Nations twice. The Minister was reported to have told group of Journalists in Abuja on Monday that all ground works have been concluded for the EFCC to move in and check the books of the NFF. 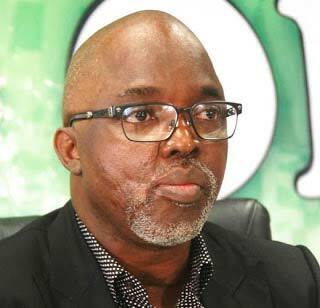 Apparently aware of the Minister’s resolve to probe the NFF, the President of the Federation, Amaju used the occasion of the Lagos Marathon post race lunch on Saturday to plead for support from the journalists, insisting that the recent negative reports on NFF have driven sponsors away. According to the source, Amaju opined that if the bashing continues it may rob the country of the World Cup 2018 ticket even as Nigeria prepares for the epic match against the Indomitable Lions of Cameroon in September. In a week that the Supreme Court of Nigeria is likely to announce the date for the final verdict lingering legal battle between the two factions of the NFF couple with the outrage over last week’s FIFA ban on Chris Giwa and four his board, the Amaju-led board may have bitten more than they can chew.